This comprehensive new resource presents a highly informative overview of cloud computing security issues. This book focuses on relevant approaches aimed at monitoring and protecting computation and data hosted on heterogeneous computing. The most critical security aspects are thoroughly discussed, highlighting the importance of reliable secure computation over remote heterogeneous cloud nodes. 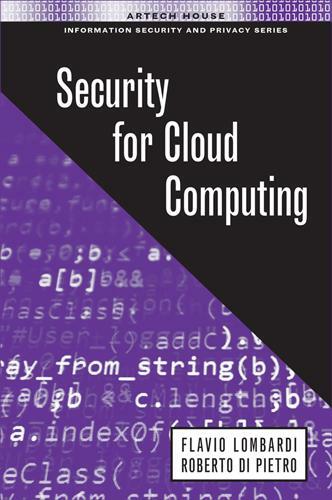 This book shows that present cloud computing is inherently insecure therefore advanced execution models have to be developed in order to prevent unauthorized users from accessing or affecting others' data and computation. The cloud approach enables on-demand scalable services that allow performing large computations without the costs and maintenance/management issues of costly server farms (thus enabling a novel kind of outsourced computing). Essential reading for software and computer engineers as well as data architects and IT professionals to better understand the complexity and heterogeneity of modern cloud- based scenarios.